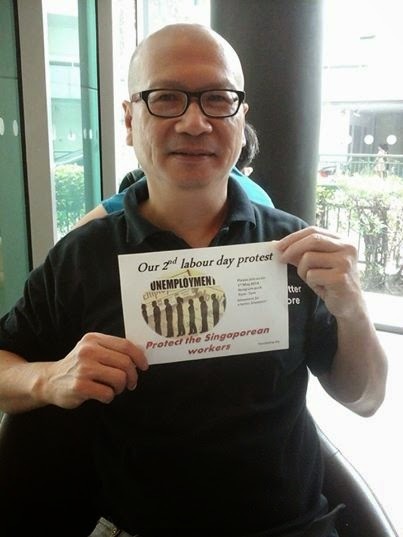 Police have contacted Mr Gilbert Goh on 30 April 2014 regarding his online post (19 April 2014) that called on the public to deface and denigrate a poster of the Prime Minister during Goh’s planned demonstration at Hong Lim Park on 1 May 2014. Mr Goh was advised against carrying out such activities during the demonstration as they may constitute offences under the Penal Code and the Miscellaneous Offences (Public Order and Nuisance) Act. Mr Goh was also advised to remove any online postings that called on participants of his demonstration to conduct activities that might be against the law. The Speakers’ Corner is a designated outdoor area for Singaporeans to express their views in public. Mr Goh is free to hold his planned demonstration at the Speakers’ Corner, but it is also his responsibility to ensure that any activities conducted during the demonstration do not contravene the law. There's a law against defacing a poster of the PM? What is this "Penal Code and the Miscellaneous Offences (Public Order and Nuisance) Act"? The police seem rather vague about it. I'm no lawyer. So I just googled it. There is no law that specifically say you can't deface the PM's poster, but there seems to be a whole bunch of offences listed under the act that could make it illegal. (b) displays any writing, sign or other visible representation which is threatening, abusive or insulting, thereby causing that person or any other person harassment, alarm or distress, shall be guilty of an offence and shall be liable on conviction to a fine not exceeding $5,000. (b) displays any writing, sign or other visible representation which is threatening, abusive or insulting, within the hearing or sight of any person likely to be caused harassment, alarm or distress thereby shall be guilty of an offence and shall be liable on conviction to a fine not exceeding $2,000. (b) distributes or displays to another person any writing, sign or other visible representation which is threatening, abusive or insulting, with intent to cause that person to believe that immediate unlawful violence will be used against him or another person by any person, or to provoke the immediate use of unlawful violence by that person or another person, or whereby that person is likely to believe that such violence will be used or it is likely that such violence will be provoked shall be guilty of an offence and shall be liable on conviction to a fine not exceeding $2,000. (b) distributes or displays to a public servant in the execution of his duty as such public servant any writing, sign or other visible representation which is indecent, threatening, abusive or insulting, shall be guilty of an offence and shall be liable on conviction to a fine not exceeding $5,000 or to imprisonment for a term not exceeding one year. The trouble is that if using "insulting words or behaviour" towards another person (PM or otherwise) is an offence, then all of us should be arrested under the act. You don't even have to deface any poster. And I don't think Hong Lim Park is some magical safe zone where suddenly all laws don't apply.